When I very first started trading I quickly and swiftly fell in love with indicators. As soon as I had found, learned how to use and started trading with the latest indicator, I was soon moving on and onto the hunt for the next indicator that would help me in my never ending quest of confusion which you will fully understand in just one moment. In this guide we will go in-depth into why price action trading has worked for so long and how you can use it in your own trading. Below is a table of contents so you can flip back and fourth through the sections as you need. When I First Started Trading I Run Into a Huge Problem! What is a Price Action Trading System? How Can You Use Price Action to Consistently Profit? What are the Types of Trades Price Action Traders Take? What Else do Price Action Traders Use to Make High Probability and Low Risk Trades? A huge reason traders get stuck with indicators, expert advisors, robot systems etc, for so long before breaking away is because of the mindset that they instill. They breed a mindset of not only getting rich quick, but of the continual search for the ‘Holy Grail’ or silver bullet to fix all problems and be the answer to everything all at once. There are literally right at this very moment millions of traders in forums, trawling websites looking for the magic system or indicator. It can often take a lot of losing and searching before a trader will start to see that the Holy Grail is alive, but it is not what they first thought. The Holy Grail is not an indicator that you turn on and it makes you a million dollars overnight, it is learning how to trade so that you can become successful long-term and make money with an edge over the market that will not one day just stop because the market conditions changed. The very appealing factor to indicators, expert advisors, black box systems and the like is that traders are looking to something else other than themselves to make the trade call and decision. What I mean by this is that, traders often look to take the psychological burden or weight off their shoulders. Instead of taking responsibility for the decisions they make and learning how to lose properly (which is a major part of trading), often traders will learn how to hide behind other things or follow others or use indicators so they can internally blame them if things don’t go their way. When the trade wins they can tell themselves internally “Great job, you picked a great winner”, but if the trade loses, they have the indicator to look at and palm the blame off to for pointing them in the wrong way. The problem I was facing when I very first started trading and that a lot of traders face with indicators is that more often than not they are not used to help ‘indicate’ any situation. They add confusion upon confusion and the more confused a trader gets about indicators, the more they think they need indicators. The more confused a trader gets about indicators, the more they think they need indicators. What often starts as a hunt to learn as much as possible, will end in the first indicator being used. From here the trader will often make a winning trade followed by a loser or two. The question will be asked as I also asked myself “If one indicator helped me pick the correct direction, then another one must be even better, and another after that, and another, and another etc, etc,” until the chart is a bomb site. Either consciously or subconsciously this is a very important factor. The reason traders like signal services or why sites like Etoro are so huge and also why traders are always comparing against each other is because they find it EXTREMELY DIFFICULT to go out 100% by themselves and make all their own trade calls looking to no one else at all. I bet you are asking that question right? Unfortunately not many traders either believe it, or they believe it and don’t do anything about it, but the major cause for traders failing to become successful is they are unable to make great decisions time and time again. Simple examples of this are; 1: A trader puts on a trade and does not follow their plan to take profit when they should and price turns around and stops them out for a loss instead of banking a profit, 2: A trader does not execute their stop loss when they should and their stop blows out way larger than it should, 3: A trade forms that fits perfectly, but the trader does not take the trade because they are scared from the previous 4 losses in a row they have had and watch this new trade turn into a large winner that would have put them back into profit. There are 3 x examples of simple decision making errors that traders are making every single day over and over again. Traders are making trading rules and trading plans and then breaking these rules the very next trade. The reason I have started this lesson with this information first is because you can learn all the price action trading strategies back the front and sideways, BUT if you don’t make great decisions and if you don’t stick to your plan and be disciplined, then you may as well be flipping coins. It is my job in this guide to make sure you have the best understanding of what it is you need to do and where you need to go from here to have the greatest chance of success. I am often asked if price action is either ‘old fashioned’, if the price action trading method is “out of date” or if it will continue to work in the coming years. Now, obviously I cannot predict the future. For all I know the markets could collapse making all methods useless. So, before I go making silly statements or predictions, let me give you a little background information so that you understand the history of price action and then you can learn exactly how to start making price action trade setups. Let me introduce you to the “God of the Candlestick” or the “God of Price Action” as we know it today! Candlestick charts or ‘price action’ as we know it have been around since the 1800’s since the Japanese man Honma Munehisa who used these charts to make a fortune on the rice markets. A lot has changed since these early days, but in a lot of respects a lot has stayed the same. Price action has been around for hundreds of years and whilst computers are now in the markets more than they have ever been, price action trading is the most common form of trading amongst professional traders. Price Action trading involves analyzing just the raw price action data on a clean chart with no indicators whatsoever. What so many traders fail to realize is that the indicators they are using in their trading are built from using old price data to give them a lagging indicator. Price Action traders are taking the live price, as it is continually being printed onto their chart, and making trades. Price Action trading is the skill of being able to read the price and make trades on any chart, in any market, in any time frame, and without the use of any indicators at all. In very basic terms, Price Action illustrates in a way that a trader can see exactly on a chart what a certain pair did for a particular time frame. Price Action illustrates in a way that a trader can see on a chart what a certain pair or market did for a particular time frame. For example, the individual candle sticks or bars will show how high the pair went, how low the pair went, and also, the open and closing prices. Most charting platforms can produce candle sticks and bars for time frames varying from 1 minute to 1 month. Another way to think about it is; Price Action is everything traders are doing and how they are doing it, shown in a chart form. Below is a chart showing a really clear example of a price action chart that you want to be using in your trading. Notice how the only thing on this chart is a strategically placed support level and NOTHING else? There is not a heap of indicators and moving averages crossing over and who knows what going everywhere. The price is the most important factor and we need a clean chart, so that we can analyze the price action story. Price Action trading is a method that is commonly used by professional traders. Most professional traders use a very logical system that is not complicated, whereas most amateur Forex traders are hung up looking for the “Holy Grail” system and indicators that will bring them all their riches overnight. Price Action is a system that is very logical and has clear rules in place. Instead of using indicators that cannot adapt to different types of markets, price action involves the trader making trades based on key signals forming in the market. Traders have been using price action in different markets for literally hundreds of years to trade with. Price action was first traded successfully hundreds of years ago. The same just cannot be said for other flash-in- the-pan methods. Price action trading is a logical trading method that has been around for a long time and will continue to be around for a long time to come. Price Action traders are using the information gained from the price action chart to make their trading decisions. Traders have their key signals that they are looking to present in the market for them to make a trade. Has price formed a false break? Is price at or near a major support or resistance level? Has price formed a key reversal trigger signal indicating that the market is going to make a move? Using the price data, the price action trader can plot the key supply and demand levels on their charts. They can also identify when price is about to either break out or reverse, and they can use this information to take profitable trades. Price Action traders are constantly assessing price for any “Trigger Signals” they could use to take a trade or manage open trades. Price action traders use key candlestick patterns at key areas on their charts to enter into trades. One example of a price action trigger signal is the Pin Bar. The Pin Bar is a reversal signal that can be found on any chart and on any time frame. A Pin Bar is a powerful price action signal when entered from the correct areas on the chart, and it is made up of 1 candle. Pin Bar’s can be used to pick both long and short trades (buy or sell) and will often be the signal to change the current trend or momentum. The Pin Bar is just one price action pattern of many that the price action trader can use. Other price action setups can include engulfing bars, 2 bar reversals, inside bars, continuations, breakouts, and false break patterns. Not all Pin Bar’s are created equal. Price Action traders use more than just the last candle to decide whether to take a trade or not. The whole price chart is information that the trader will take in when deciding to make a trade or not. The very best Pin Bar’s will be traded when they are with the obvious trend and at key support or resistance levels in the market. Below is an example of a Pin Bar at a key resistance level. As I said above, Price Action is more than just looking at the last candle or the trigger signal to make a trade. That is what pattern traders do, but successful price action traders use the whole chart to make trading decisions. Price is always telling us something, and learning how to use that information is critical in learning how to read and trade the whole price action story. When trading with the trend, traders are looking to take trades in the direction of the current trend. Whilst a very simple strategy, it is quite often overlooked by many traders. You most likely have heard of sayings, such as “The trend is your friend until it bends”, and this is very true. The best trades will be found when trading with the trend. The very best way to start increasing your chances of placing winning trades, and also, having those trades be bigger winners when they do win is to always trade with the trend. It is simply amazing how often this super simple, yet super powerful strategy gets overlooked. The best trends to be trading with are the most obvious ones because the more obvious they are to you, the more obvious they are to everybody, and it also means that they are strong and clear cut. When trends are hard to spot and you are unsure if price is or isn’t trending, then you have to question the strength of the momentum. There are many methods for identifying both trends and trend changes, but all that is needed is price action and nothing else. NO other indicators or fancy black-box systems or moving averages are needed. A price action traders’ job is to learn how to not just make entries, but read the whole chart including the trend, trend changes, and other market types. Even more important than the trend direction is the key support and resistance levels. The reason support and resistance is so important is because that’s what the rest of the market is also looking at, and also, because these levels are acting or working as major areas of supply and demand. Forex is the best market in the world for support and resistance. A huge reason for this is mainly because of the size of the market with the turnover regularly exceeding 5 trillion dollars each day. That is why Forex is so popular as a market to trade, and also, why the major support and resistance levels get so well respected time and time again. Whilst major support and resistance levels will not always hold, they will very often act as key levels to make highly profitable trades from. The reason behind this is because, as I hinted to above, they are acting as supply and demand levels. Just as in everything we purchase in real life, from the apple at the green grocer to the meat we buy at the shops, has it’s price determined by supply and demand; so does Forex. The simplest way to explain this is to give an example. A few years ago in Australia, we had a banana shortage. All of a sudden, there was a real shortage of bananas. There was a huge demand, but the supply could not meet it. The price went from the normal $2 per kg. to over $11 per kg. This sort of supply and demand equation happens in every market, and it happens both up and down. If there is an oversupply with too much of one thing and not enough buyers like we have had in oil of late, then price goes down. The Forex market works exactly the same, and that is what price action traders are looking at with their support and resistance charts. Price Action traders are constantly looking for key support and resistance levels to trade from. The reason a price action trader is looking to make a trade from a major support or resistance level and not just in the middle of nowhere, and he/she is also trying to pair that support/resistance level with a trend if they can. is because the support or resistance level is where the major supply and demand levels are. As I have just explained above about supply and demand, all the big order flow and big supply/demand that is going to give price the big push is sitting at the major levels. That is why especially pairing a support or resistance level with a strong trend can be a super powerful combination. To make a successful high probability trade setup, price action traders need to plot these support and resistance levels beforehand. When price then gets to these levels, it is about waiting for price to make a trigger signal, and then pouncing quickly. I recommend you read my trading lesson on exactly how to markup your support and resistance levels, the routine you should be using in your trading, and the time frames that are the best for support and resistance. 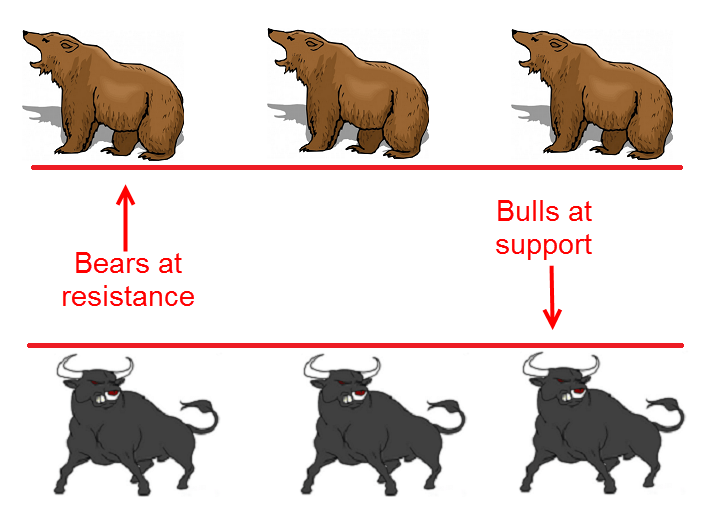 The Ultimate Guide to Marking Support and Resistance on Price Action Charts. Below is an example of how a trader can use these support and resistance levels to make a trade. The chart shows a Pin Bar trigger signal that has formed at a key support level. Price then rejects the support level and moves higher. Below is an example of how a trader can use these support and resistance levels to make a trade. The chart shows a Pin Bar that has formed at a key support level. Price then rejects the support level and moves higher. There are a lot of different price action pieces of information that a trader can use, such as candlesticks, different patterns, momentum, etc, but one of my all time favorites is the false break. The reason the false break is one of my favorites is because it is super powerful and can be used to be traded on many different time frames including the smaller time frames. The false break is not just one particular trigger signal in itself (although it can be), but a market movement where the market is “Faked Out” the wrong way. The best way to explain the false break is with a chart example. All false breaks, whether they are one candle or a couple of candles, need a major support or resistance level to be making a false break of. This is important. The level needs to be an important one. Make sure you first have a major support or resistance. As the chart shows below, the false break starts with price breaking out higher and through the resistance level. When price breaks out higher, the breakout traders who have been sitting and waiting for price to breakout higher now jump into the market and start buying, taking long trades. There is a quick snap back lower. This can be started off by the first buyers taking profit or for another reason, but what it does do is start to set up the false break. A big portion of the market have all jumped into long trades, and these traders now all have their stops sitting just below where price is. As price starts to reverse, all these stops tend to be like fuel to fire and that is why false breaks can be so powerful and move so quickly once they start and gain momentum. They will often start slow, and then build really quickly. Below are two videos that were made whilst trading live price action setups. These videos highlight just how high probability these price action trading setups can be when traders play them from the correct areas on the charts. Both of these trade setups were taken using the same high probability methods that are taught in the Forex School Online Price Action Courses such as trading from the key daily support/resistance level, looking to trade within the obvious trend and using a price action trigger signal such as a pin bar as confirmation etc. NOTE: If you would like a free Price Action PDF Intro Guide Download and a heap of other free trading bonuses just enter email below to access. Your comments and questions below are appreciated and I will get back to you. Or at the bottom of that page searching for the topic in search box you are looking for. For example risk reward, trade management etc.